Tis the season..yes...Christmas parties! Quilting group Christmas parties to be exact. So, on my desk this week are part of the Kris Kringle presents to gift at the parties. 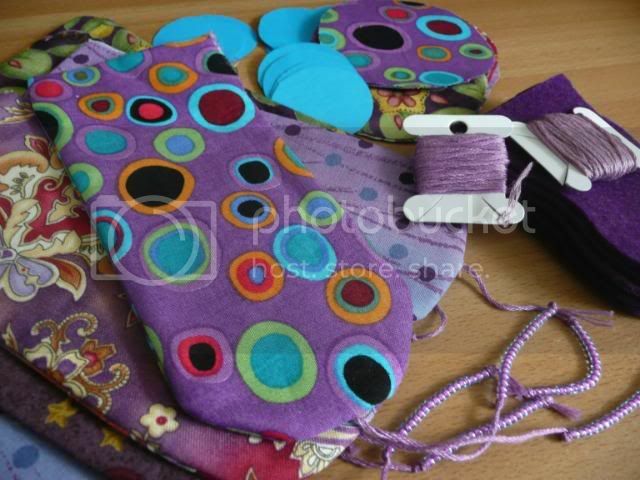 What may look like a pile of fabric,cardboard circles, felt and thread are the makings of a cute little Ready Threader. I shall pop a reel of cotton and needle inside when gifted. Perfect size to keep in your purse as an emergency sewing kit. The plan is to have these six whipped up plus a few other handmade goodies. Still looking for ideas though...any thoughts? Such a great Kris Kringle present! Who doesn't need an emergency sewing kit? I wanted to make one for myself too! Just saw it on a book. You let me feel like I should really make one!